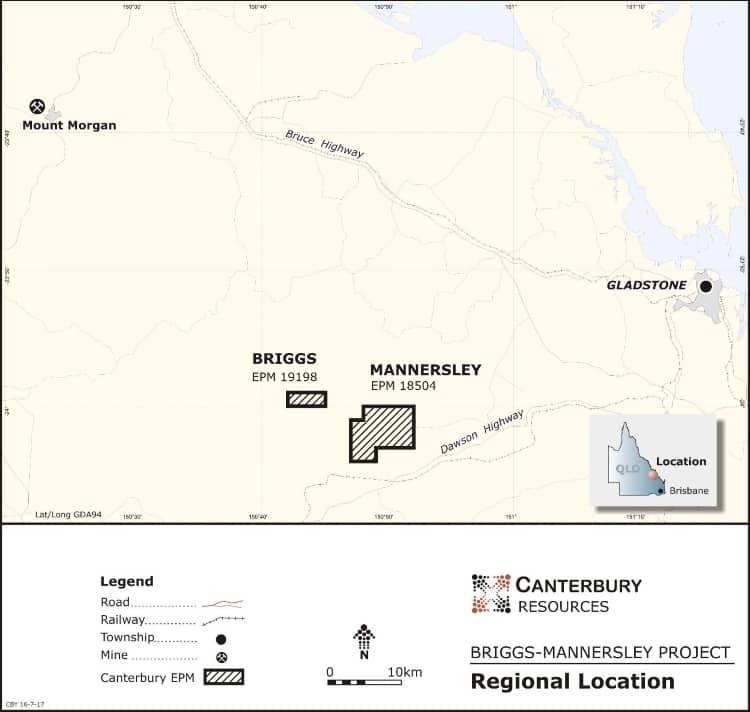 In Australia Canterbury holds 100% of the Briggs (EPM 19198) and Mannersley (EPM 18504) projects, which are prospective for large scale porphyry copper (± gold, ± molybdenum) mineralisation. The projects were acquired from Rio Tinto Exploration Pty Ltd in February 2017. Rio Tinto retains a 1% net smelter royalty (NSR), plus certain claw back rights in the event of a major discovery. The two tenements are located inland from Gladstone, about 10km apart, at the southern end of the northwest–southeast trending Mt Morgan structural belt. The high-grade Mt Morgan mine produced around 8Moz of gold and 350,000t of copper before its closure in 1989. The potential to delineate an economic project in this region is enhanced by its accessibility to critical infrastructure, including power, transport, industrial services and skilled labour. A porphyry copper (± molybdenum ± gold) system with a large surface footprint. Shallow drilling has confirmed the copper mineralisation extends to depth and this will be tested by planned drilling. Another large porphyry copper (± molybdenum ± gold) system, albeit representing a more discrete target. 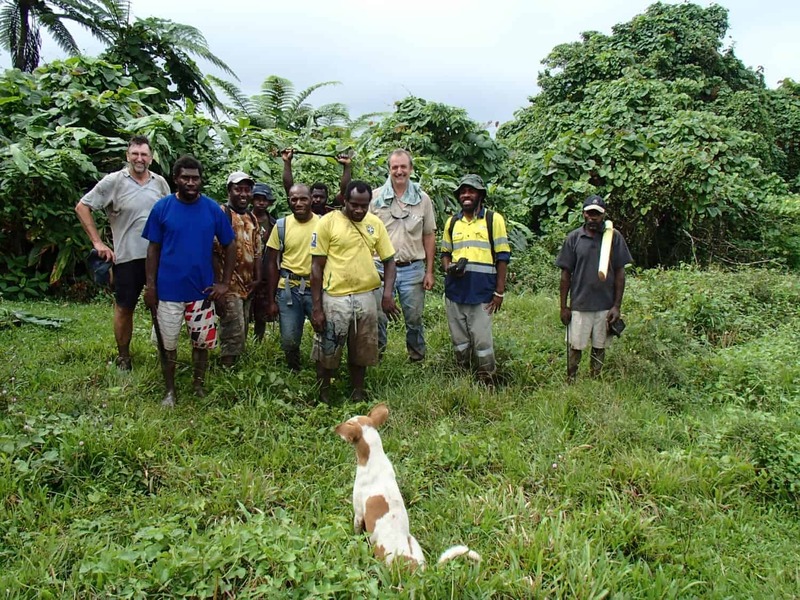 At Briggs, past explorers have included Noranda (1969 – 1972), Geopeko (1970’s), Plutonic (1980’s), CRA Exploration (1990’s) and Rio Tinto (2011 – 2017), while at Mannersley, explorers have included Geopeko (1969 – 1972), Goldfields (1987), Asarco (1990 – 1991) and Rio Tinto (2010 to 2017). 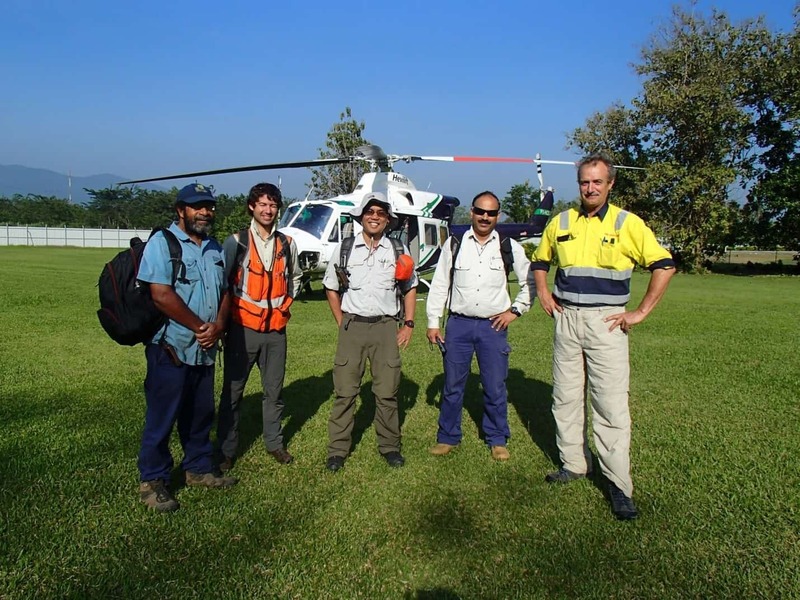 These explorers have generated extensive geological datasets over the properties, outlining multiple large porphyry style mineralisation systems. Limited drill testing of these systems has discovered extensive low-moderate grade copper mineralisation, but is yet to discover the potentially higher grade “causative intrusion” at any of them. Canterbury believes that the relative timing and spatial distribution of intrusion, alteration and mineralisation is crucial in effectively exploring porphyry systems, and is applying modern understanding of porphyry systems to optimise its exploration planning. Evaluation of the Briggs system is at a more advanced stage than for Mannersley. At Briggs a dominant northwest structural corridor is evident from magnetics and surface geochemistry, and historical mapping has outlined three intrusive centres; known as the Northern, Central and Southern zones. Within these zones multiple broad intercepts of low grade disseminated copper mineralisation have been encountered, often overlain by a higher-grade supergene enriched copper blanket. In general, the mineralisation at Briggs appears to display typical porphyry alteration patterns, with a large propylitic halo surrounding a zone of phyllic and potassic alteration that defines the geochemical core of the intrusive system. 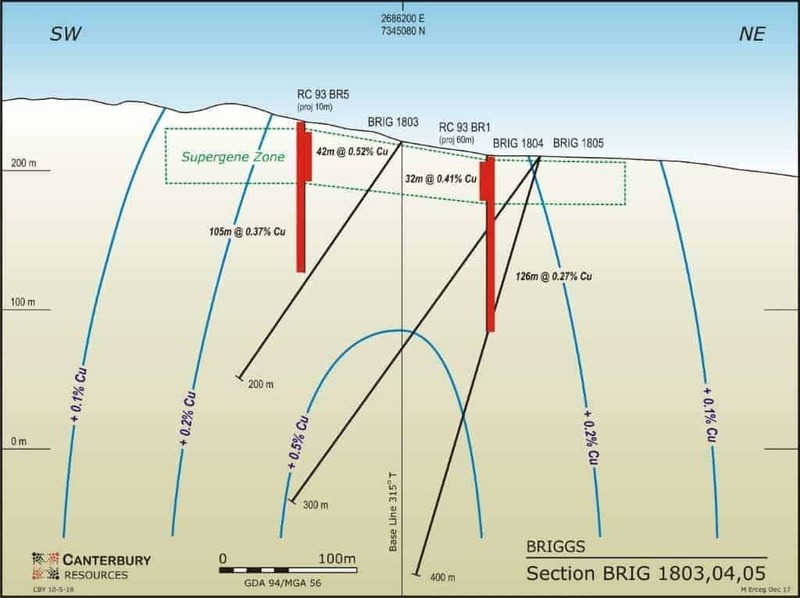 Drilling to date has outlined extensive copper mineralisation in near surface supergene zones, but has only sparsely assessed the deeper potential. Primary mineralisation consists of chalcopyrite, pyrite and minor molybdenite, with the copper mineral found disseminated and in veins associated with quartz and oligoclase, while the molybdenite is commonly found coating fractures and associated with veins of pyrite- quartz-albite. Both copper and molybdenum occur within the main intrusive phase and adjacent to the intrusive in a skarn zone. 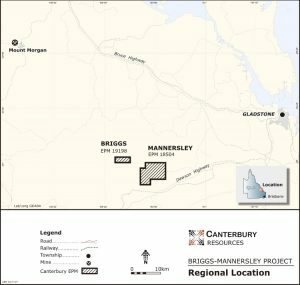 Canterbury has designed an initial phase diamond drilling program, scheduled to commence in September 2018, as the next phase of exploration at Briggs. The program comprises nine holes for around 3,000m. 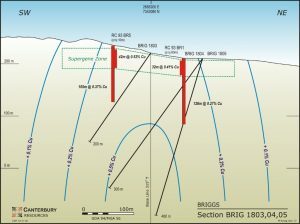 Most of the holes will further assess mineralisation within the ~500m strike length of the Central Zone where historic drilling has broadly outlined near surface copper mineralisation, but is yet to encounter the causative intrusive that potentially represents a deeper higher-grade core of the system. 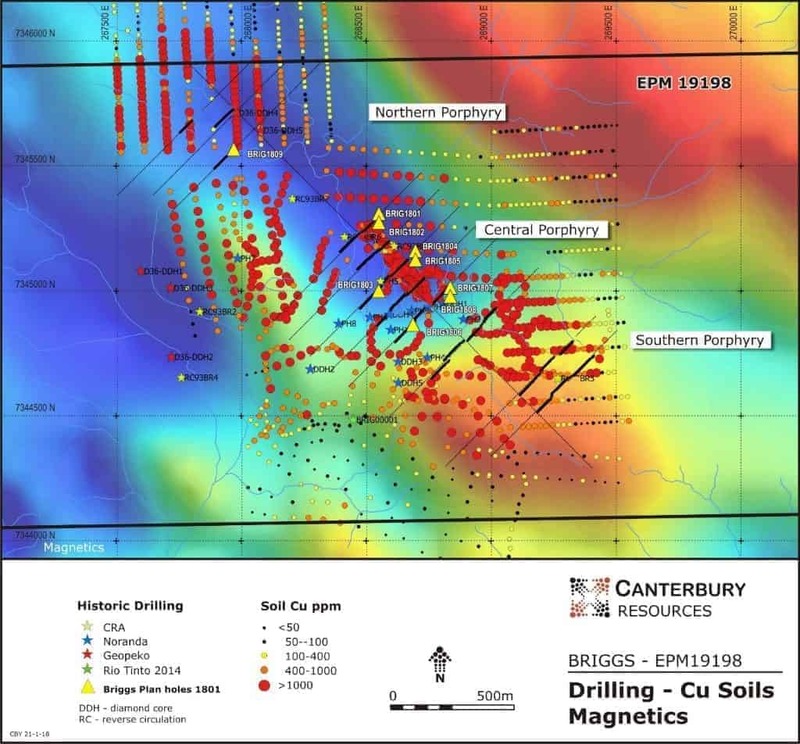 Canterbury has estimated an Exploration Target of 45 to 165Mt at 0.4 to 0.8% copper for the upper 300m of the Central Zone, and the current drill program should also generate vectors to assist in locating a higher-grade core which typically occurs in this type of system. The Northern and Southern zones are indicated from a combination of geological mapping, surface geochemistry (copper in soils) and magnetic data, but only very isolated historical drilling has been undertaken, albeit with encouraging results. A single hole in the Southern Zone, RC93BR3, was drilled by CRA Exploration in 1993 and returned 108m at 0.23% Cu from 2m, finishing in mineralisation. In the Northern Zone one hole, D36-DDH4, drilled by Geopeko in 1974 encountered 152.5m at 0.21% Cu from surface, finishing in mineralisation. The 2018 drill program will include a scout hole in the Northern Zone. A follow-up program of infill and extension drilling is proposed in 2019, dependent on results achieved in the 2018 program. The Mannersley porphyry was discovered in 1972 by Geopeko which drilled three shallow holes testing geochemical anomalies. However, these holes failed to test the core of the porphyry system. Peripheral to the intrusive are a series of magnetite bearing skarns which appear to be shedding gold into creeks that flow radially away from the porphyry. Rio Tinto also reports visible gold in samples draining from the intrusive complex and there are many historical gold workings dotted along these creek systems. Canterbury regards these as being worthy of more detailed assessment. The Company is also intrigued by the unusually large (~3.5km2) size of the Mannersley intrusive complex and the associated potassic (biotite) alteration which is atypical of Queensland porphyries. 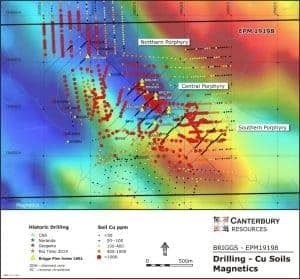 Canterbury plans to complete detailed surface mapping and re-evaluate the historic geophysics to generate targets for scout drilling.